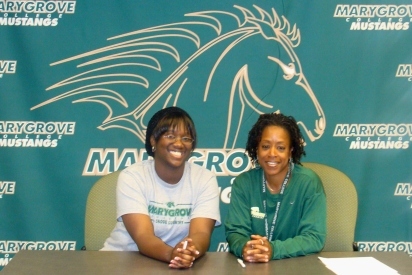 DETROIT, Mich.-Women’s track & field added another local star with the signing of a former MHSAA State Champion, Shanique Maddox. The talented distance runner joined a growing class of highly-respected Mustang student-athletes by signing a 2010-11 Letter of Intent. After a three year hiatus, the 2007 Mumford High School graduate is ready to get back into the world of competitive track & field. Despite the layoff, Maddox is no stranger to running at a high level. As a freshman, Maddox took home a MHSAA Regional Championship in the 800m. She added to the impressive feat by earning a Detroit PSL Championship in the 3200m. Maddox’s AAU resume was equally impressive with regional, state and national qualifying times since 2000. In 2004, she ran her way to an AAU All-American nomination in the 800m. In all, Maddox competes in the 800m, 1600m, 3200m, and 4x800m relay. She also runs cross country as part of an intense year-round routine. Asst. Coach Womack on Maddox: Shanique is an extremely gifted young lady with a high school track record that speaks for itself. With training, I expect Shanique to make a smooth transition into intercollegiate competition. I look forward to coaching her and the rest of the team in the fall.